Ambient marketing is a form of complex corporate communication that uses elements of the environment that create messages that grab the consumer’s attention. This type of marketing is all about placement. The advertising can sometimes be found in unusual and unexpected locations. It can be found anywhere and everywhere from hand dryers in public bathrooms to bus stops and golf-hole cups. And many times consumers can actually interact with these advertisements. When working with Ambient marketing the more creative a company gets, the more beneficial it will be. 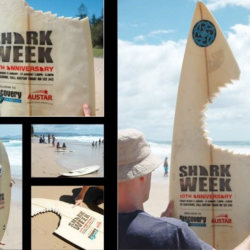 Discovery Channel used Guerrilla marketing to advertise Shark Week’s 10th anniversary. They laid a surfboard on the beach that looked like a shark had bite a piece off. They reached their main target audience by choosing to advertise on the beach. They also did an excellent job grabbing the audience attention with the bite mark on the surfboard.